We look forward to getting to know you and your family through the application process! 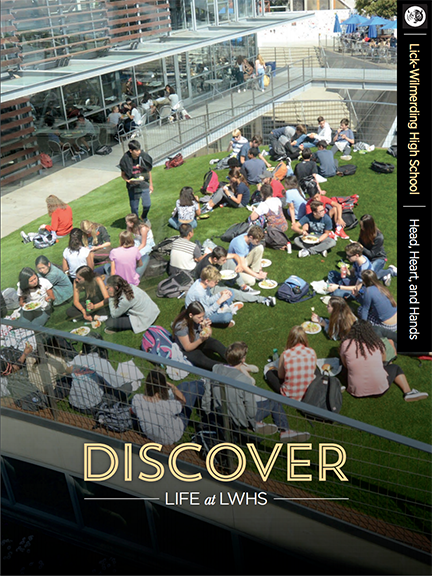 Thank you for your interest in Lick-Wilmerding High School! We invite you to become better acquainted with the school during the application process. On this page you will find all the information you need to successfully navigate the LWHS application process. If you have any questions, our Admissions Team is here to assist you in any way we can. 8th graders who are interested in learning more about LWHS should submit an inquiry form in late August. Campus "Shadow" Visits will begin Tuesday, October 2 and end Thursday, December 20. Submit the Campus "Shadow" Visit Request Form to schedule a visit. Visits between October 2–November 2 can be requested beginning Wednesday, September 12 at 7:00pm. An email invitation will be sent to 8th grade families who have submitted an Inquiry Form. Visits from November 6–December 20 can be requested beginning Monday, October 22 at 7:00pm. An email invitation will be sent to 8th grade families who have submitted an Inquiry Form. To learn more about our visit program and the date and time options available, please go to Visit LWHS. 2018–19 Open House dates are: October 14, October 27, November 11, December 1, and December 9. Registration for 2018–19 Open Houses begin on Tuesday, September 25 at 7:00pm. An email invitation will be sent to 8th grade families who have submitted an Inquiry Form. Reservations are required to attend and can be made after an inquiry form has been submitted. Find more information here. LWHS accepts SSAT or ISEE test scores. Please note that we must receive score reports from each testing organization, and will not accept photocopied or unofficial reports from applicant families. Scores will not be accepted for tests taken after January 31, 2019. The application will be available Monday, September 10. The courtesy deadline for Part I of the application is Monday, December 3, 2018 which prompts scheduling of the student interview. The final deadline for submission is Thursday, January 10, 2019 by 3:00pm. Final deadline for submission is January 10, 2019 at 3pm. Members of the Admissions Interview Committee will conduct 30 minute interviews with student applicants. Students are interviewed in pairs and engage in conversation about their interests and hopes for their high school experience. Student interviews are informal in nature, so no preparation is necessary. Interviews are scheduled after the Admissions Office receives Part I: Parent/Guardian Application and the application fee. Recommendation forms should be completed by the applicant's counselor/principal, 8th grade math, and 8th grade English teachers. Be courteous by submitting a recommendation request to your teachers by November 1, so they have plenty of time to complete the recommendations by January 10, 2019. Your parent/guardian must complete the Transcript Release Form and deliver it to your school's counselor/registrar to have your 7th and 8th grade transcript sent to the LWHS Admissions Office by January 21, 2019. If your 8th grade fall semester or trimester grades will not be completed by then, please ask your school's registrar to send them to our Admissions Office as soon as they are available. The following timeline features important deadlines and dates to remember throughout our application process. Feel free to contact us with questions. Submit an inquiry form in late August. Wednesday, September 12 at 7:00pm—Campus “Shadow” Visit Request Form for visits from October 2 through November 2 is emailed to 8th grade families who have submitted an Inquiry Form. Visits can only be scheduled by submitting the Campus “Shadow” Visit Request form (8th grade students only). RSVP for an Open House. An email invitation will be sent to families who submitted an inquiry form beginning Tuesday, September 25 at 7:00pm. Register for the SSAT or ISEE. Submit an inquiry form if you have not yet done so. Tuesday, October 2—Beginning of campus shadow visit program. Open House—Sunday, October 14, 1-4pm. RSVP required. Monday, October 22 at 7:00pm—Campus “Shadow” Visit Request Form for visits from November 6 through December 20 is emailed to 8th grade families who have submitted an Inquiry Form. Visits can only be scheduled by submitting the Campus “Shadow” Visit Request form (8th grade students only). Open House—Saturday, October 27, 1-4pm. RSVP required. If you have not requested information about our Flexible Tuition program through the online inquiry form, please email the Admissions Office (admissions@lwhs.org) with your request (optional). Open House—Sunday, November 11, 1-4pm. RSVP required. Campus visit program continues. Submit the Campus “Shadow” Visit Request Form to schedule a campus shadow visit (8th grade students only). Ask current teachers to complete recommendation forms. Request official transcript from your middle school. Courtesy Deadline—Monday, December 3, Part 1: Parent/Guardian Application and application fee. Student interview is scheduled upon receipt by Admissions Office. The courtesy deadline is intended to encourage families to submit Part 1 and pay the application fee, which is required to schedule a student interview. It is not a firm deadline for any part of the application. Open House—Saturday, December 1, 1-4pm. RSVP required. Open House—Sunday, December 9, 1-4pm. RSVP required. Thursday, December 20—End of campus visit program. Make an appointment with your tax preparer for the first week in February (or as soon as possible) if you plan to apply for Flexible Tuition. Deadline—Thursday, January 10, by 3pm, ALL APPLICATION MATERIALS including Part I: Parent/Guardian Application, Part II: Student Application, recommendation forms, and official transcript. Student Interview days—Saturday, January 12 and January 26 from 9am-3pm. Deadline—Thursday, January 24, FLEXIBLE TUITION APPLICATION. The Parents' Financial Statement (PFS) must be completed online and submitted to School & Student Services (SSS). Deadline—Friday, February 15, FLEXIBLE TUITION APPLICATION. Upload 2018 Tax Returns, W2s, all schedules, Form 4506-T, and LWHS Supplemental Information Form on SSS website. Thursday, March 21—Admissions Decision Letters and Flexible Tuition Awards Mailed. Friday, March 22—Admissions Decision Letters and Flexible Tuition Awards Emailed after 4pm. Thursday, March 28 by Noon—Flexible Tuition Enrollment Contracts Due. Friday, March 29 by Noon—Full Tuition Enrollment Contracts Due.